A genuine collection of drums, handpicked for indie music but reaching farther, beyond the divides of a specific genre. The Indiependent SDX presents an impressive collection of vintage drums recorded at a true landmark in the ever-shifting rock and indie scene of Seattle, WA – the Avast! Recording Co.
For the past twenty years, this seemingly modest studio has left sonic footprints not only in recent music history but a vivid dent on culture as we know it. And even if bands like Fleet Foxes, Death Cab for Cutie and Band of Horses went on to greatly transcend any studio or sound, there’s a special something attributed to anything that exits these doors. Welcome to possibly the world’s most genuine and unique collection of drum samples – handpicked for indie music but reaching farther, beyond the divides of a specific genre. Put the I in independent. Because that’s what Superior Drummer 2 offers – the powerful framework to translate what you hear in your head into reality. 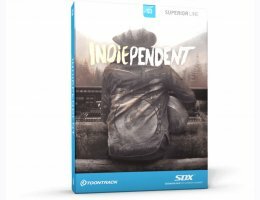 The Indiependent SDX comes from the same sessions as the widely popular Indie Folk EZX but features the raw, unprocessed recordings. In addition, it comes with two extra complete kits, several additional instruments and a total of sixteen mixer channels. All in all, you get five complete kits of impeccable, all-vintage and rare drums showcasing an incredible range and detail. Mint condition kits from the ’40s through the ’60s, all captured in the balanced ambience of the Avast! room using top-tier microphones and carefully selected chains of outboard. Add to that the subtle saturation of one of the thirteen ever made Trident A-Range consoles and you have the key components in the Indiependent SDX – a collection of drum sounds firmly rooted in indie music but seeping its way through any limitations a genre might imply.